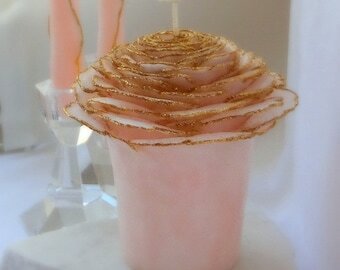 Romantic Rose Unity Candle Set handmade to order in the colors and adornment of your choice. 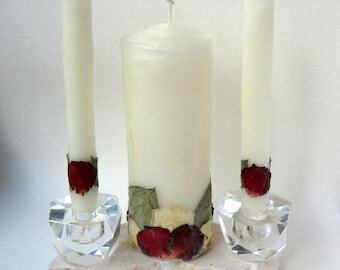 These unique Rose Candles are in my "Column" style (resembling roses just beginning to open). 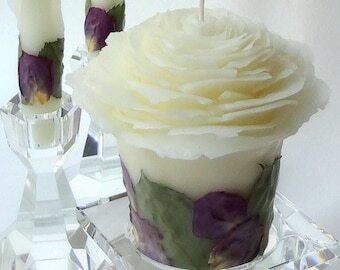 Each candle is a work of art in pure beeswax...in natural white or hand-dyed colors to go with your wedding palette. 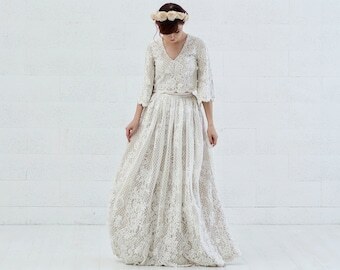 Adorned with your choice of glitter and ribbon or rose petals and leaves. Handcrafted at my art studio in California. 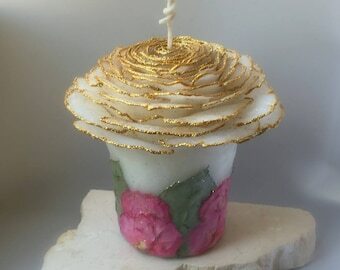 Using my original designs & techniques, no two candles look exactly the same. 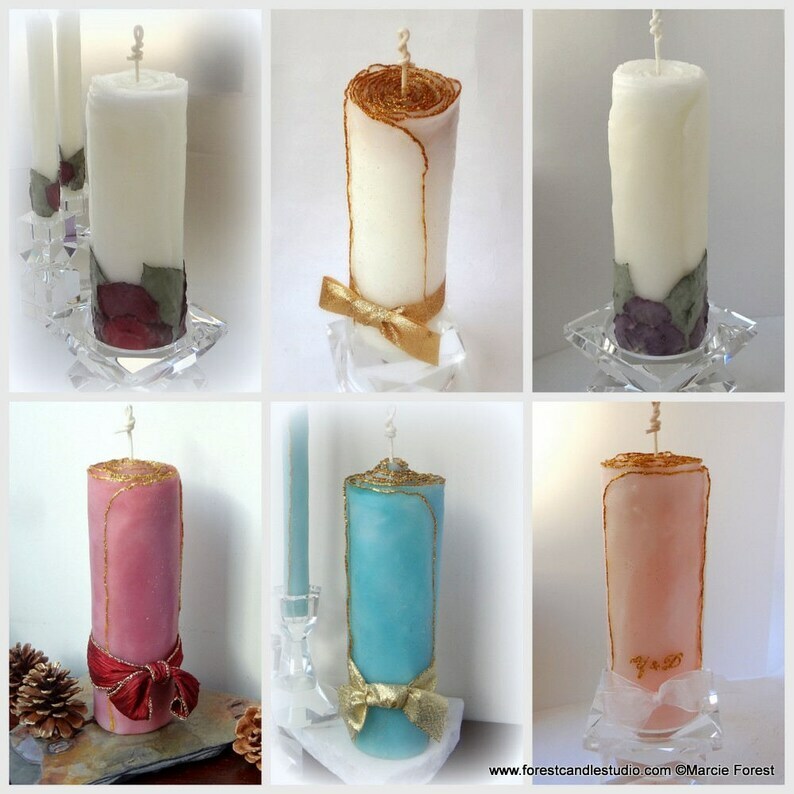 If you want a different candle color, size, ribbon, added brooches or jewels, personalization, etc., contact me to inquire about availability & pricing. A variety of options are available and custom orders are welcomed. Photos show some examples from previous orders. More colors are available than what's shown. 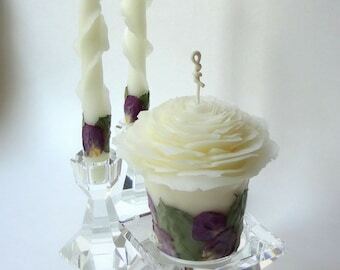 Your candles will be custom handmade to order especially for you in the colors/adornment of your choice. 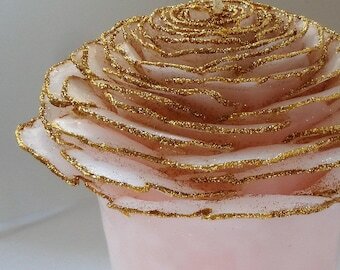 • TWO ROSE COLUMN TAPERS: approx 8" x 7/8"
Please Note: I'll contact you within 48 hrs of purchase (or you can contact me prior to purchase) to discuss your options of ribbons or rose petal colors to go with your wedding colors and personal preferences. Please tell me the wedding date & your need-by date in the note section during checkout. 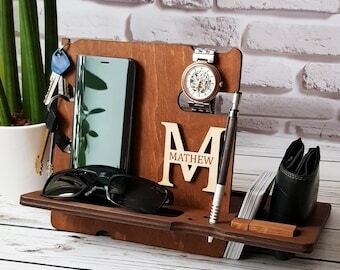 Can be sent as a gift directly to the recipient. During checkout be sure to tell me their address & what message to write on the note card. 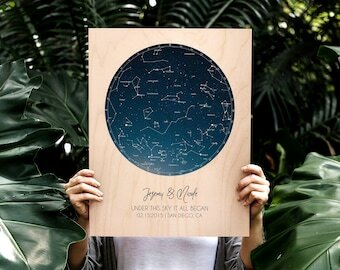 Ships via US Post Office Priority Mail with tracking & insurance, approx 3 days delivery time but can take up to 5 days. Overnight delivery via Express Mail is an available option during checkout for an additional charge.